Click here to view Old Navy Canada online offers. The Source Canada has a new contest available now! The Source Canada Contest includes: Win Samsung 40″ 4K UHD Smart TV. The contest is single entry, open to the residents of Canada, and reached the age of majority in their province/territory. The contest will take place in all Canadian provinces from today Thursday, June 8, 2017 at 10:00 a.m. ET until Wednesday, June 14, 2017 at 11:59 p.m. ET. Click here to read the contest rules and enter the contest. 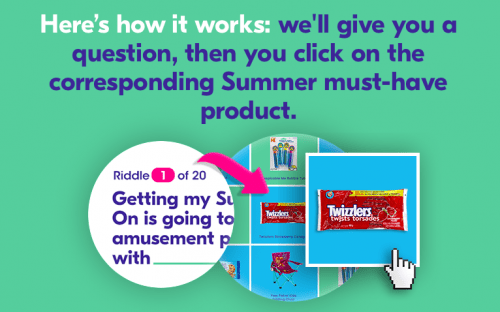 Are you looking for some fun summer games that will have you rolling in the Optimum Points? 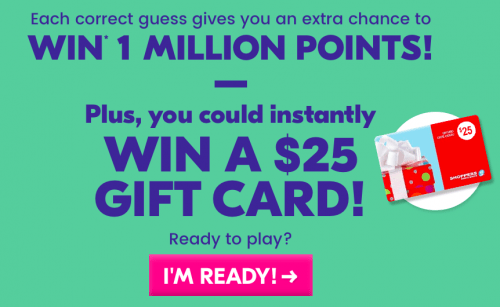 Shoppers Drug Mart Canada is hosting a contest from now until June 16 where you will have the chance to win 1 of 5 prizes that will see you winning 1 million Optimum points. Plus, you’ll also have the chance to instantly win a gift card valued to be worth $25. To enter this contest, it’s rather simple. First, you will have to enter your login information for your Shoppers Optimum Card. There is also a contest for people who do not have an Optimum card. To enter this contest, you must post a photo on Shoppers social media channels (Twitter, Facebook or Instagram) showing your Summer Bucket List moment. The photo must include the hashtag, #SummerOn and you must also tag Shoppers social media accounts: @shoppersdrugmart (Facebook – tag suggestion will appear) @shopprsdrugmart (Twitter), @shoppersdrugmartofficial (Instagram). Remember your account must be public in order for your entry to qualify. The contest will be open from Saturday, May 20th, 2017 at 9:00:01 a.m. EST to June 17, 2017 at 11:59:59 p.m. EST. After you have entered the SummerOn contest, you will be eligible to possibly win one of the ten prizes available to be won. Each prize consists of a $100 Shoppers Drug Mart Gift Card. Click here to enter the Optimum points Summer On contest, or here to learn more about the non-Optimum points Summer On contest. Get Motorola MBP33S Video Baby Monitor, 2.8 Inch, today for $99.99, list price $199.99, save $100.00 – 50% off + FREE shipping on orders over $35. Get Hatchimals – Hatching Egg – Interactive Creature – Penguala – Pink Egg by Spin Master, today for $70.00, list price $84.99, save $14.99 – 18% off + FREE shipping on orders over $35. 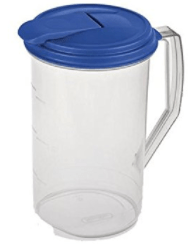 Get Sterilite 4864106 2Qt Rnd Pitcher, today for $4.47, list price $11.28, save $7.81 – 69% off + FREE shipping on orders over $35. The Amazon Canada offers are valid today only, Tuesday, May 9, 2017, while supplies last. These coupons are available from Monday May 8, 2017 until Sunday, May 14, 2017. To claim these deals, just show your coupon on the app. 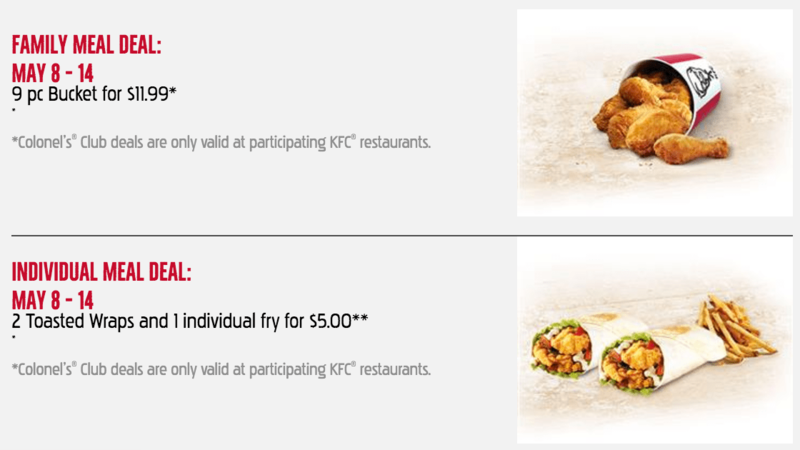 The offers are valid in participating KFC restaurants only. Limit of 1 coupon per customer per transaction. Instead of doling out a bunch of cash on your Mother’s Day gift, why not take a chance by entering into The Source Canada’s Mother’s Day contest where you will have a chance of winning 1 of 2 Fitbit Alta HR prize packs. 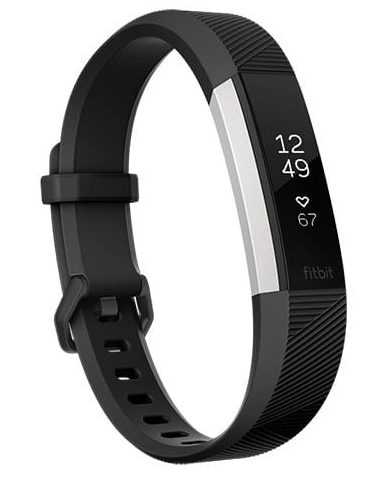 The prize pack will contain two Fitbit Alta HR’s, making the total retail value of each pack to be $399.98. This means that both you and mom can benefit in this offer, as she can have the new Fitbit as well as you. There is no purchase necessary to enter into the contest, all you have to do is simply comment on the Source’s Facebook page and describe why your mom (or person in your life who you view as your mom) deserves to win this package. You will have until May 8, 2017 at 11:59pm ET to enter into the contest. The random drawing for the contest will take place the next day, May 9, at 10am ET. Click here to learn more about the Mother’s Day contest. 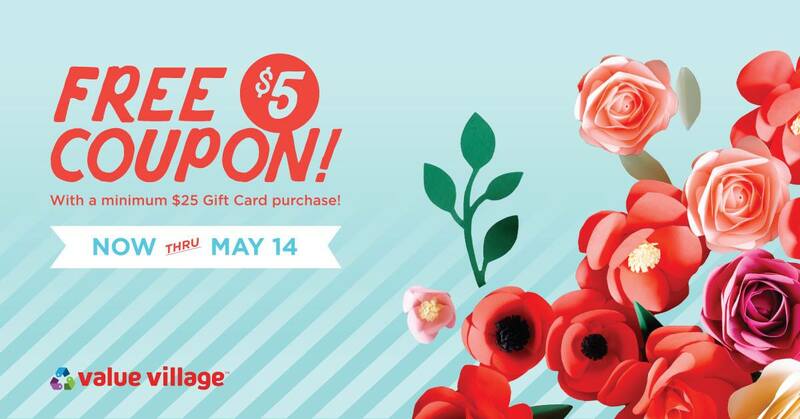 Value Village Canada has an awesome Coupon Promotion available now: Get a FREE $5 Value Village Coupon with every gift card purchase of $25 or more. The coupon is valid on a purchase of $15 or more from Monday, May 15, 2017 until Saturday June 6, 2017. Click here to get more information on this offer. The Source Canada is offering all Canadians an amazing contest where you can be entered to win a grand prize valued to be worth $459.98 retail, and the best part is you don’t have to buy anything to qualify for it. 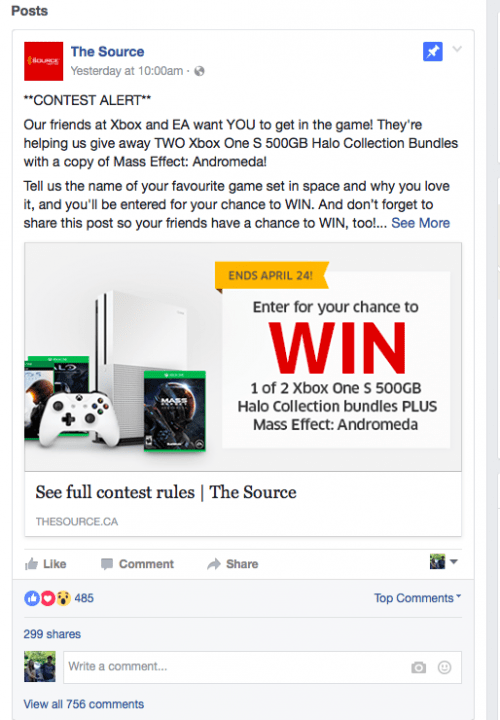 You will have a chance to enter into the contest between now and April 24, 2017 at 11:59pm ET, and after that you will be one of many who could have a chance to win an Xbox One S 500GB Halo Collection Bundle and a copy of Mass Effect Andromeda. There will be a total of two grand prizes given away, and each of these prizes will include all of the aforementioned goodies. To enter, you will first have to go to The Source Canada’s Facebook page and then comment on the Source’s Contest posts with a description of your favourite video game that is set in space and give brief description about why you love it. Included in this post must be a link to the contest’s terms and conditions, to show that you have read and understand them. After that, you will be automatically entered into the contest. There is a limit of one main entry per person, but if you’d like to add an additional entry, you can sign-up to receive e-mails from the Source in the link provided on the contest post on the Facebook page. The drawing for this contest will be taking place on April 26th, 2017 at 10:00am ET. A note of caution, it seems like a lot of people are heading over to the Facebook page to enter into the contest, so you may have to try reloading the page after a couple of minutes if you’re not able to get on there right away. Click here to learn more about the contest from the Source Canada. It’s wrapping up to be a pretty decent year for us Canadians, especially as more and more retailers and businesses continue adding offers and deals to help in the celebration of Canada’s 150th anniversary. 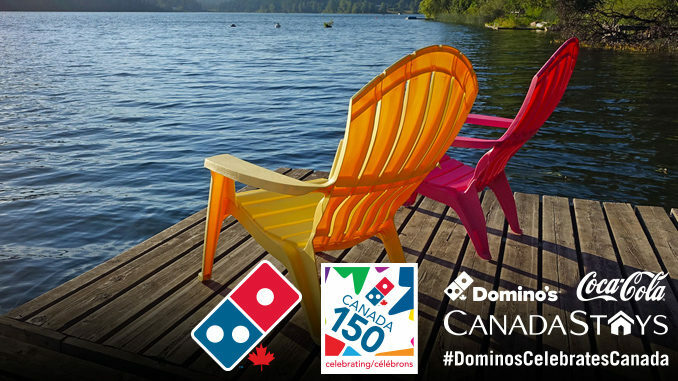 The most recent offer to be added to the ever growing list of celebrations is from Domino’s Pizza Canada, who has partnered with Canada Stays and Coca-Cola to bring us over 150 different prizes to be won. To be entered in to win these prizes you will first have to make an online purchase (or you can enter for a no purchase option here). After you make your order online, you will receive an email with a ‘code’. This code must be entered into the sweepstakes for a chance to win one of the grand or first prizes. The contest will officially open on April 10th and run for 10 weeks, ending on June 18th at 11:59pm EST. 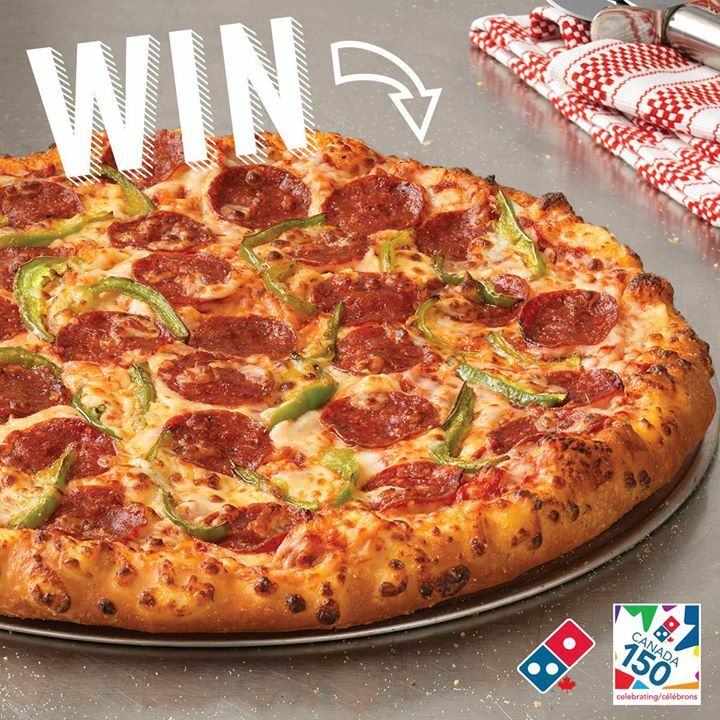 Click here to learn more about the contest from Domino’s Pizza Canada. Starbucks Canada is celebrating Canada 150 Birthday with an awesome contest. Enter for a chance to win on of the thousands prizes available. No purchase is required to enter the contest. Sign into Starbucks Rewards to begin your country wide road trip , for your chance to win one of the thousands of prizes available. 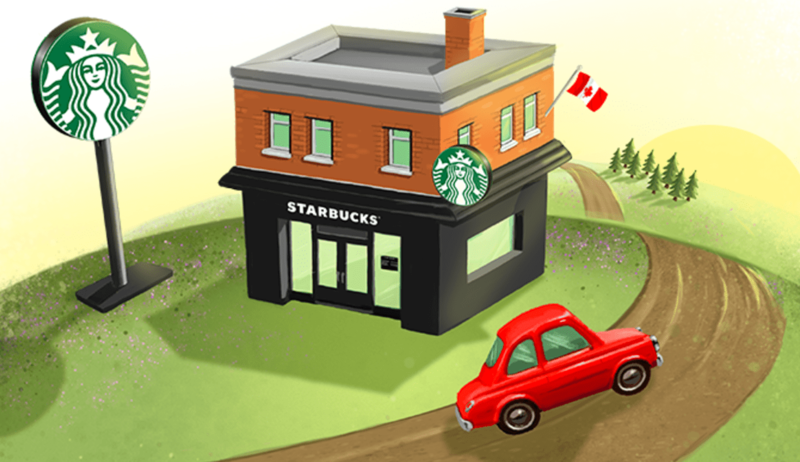 Click here to view Starbucks Canada online offers. Shoppers Drug Mart Canada is hosting a new contest for the next month where you will have the possible chance of winning 1 of 3 grand prizes of $10,000. To enter this contest, you will have to make a $10 minimum purchase at Shoppers and use your Optimum Card at checkout. After this, you will receive a contest card that contains a PIN that must be entered into this website to register. After registering your PIN online, you will be entered to win both the grand prize of $10,000 and the $25 Shoppers Drug Mart gift card. Each person will be able to claim up to 28 contest cards, and there is also the option of claiming one PIN through a no purchase necessary method. To do this, you will have to go to this website and follow the instructions for qualifying for the no purchase necessary (NPN) PIN. There will be a limit of 1 NPN PIN per customer. The contest runs from March 25th through till April 21st and the grand prize announcements will most likely be drawn and announced on April 26th. Click here to check out this week’s flyer from Shoppers Drug Mart Canada. Shoppers Drug Mart has an awesome Contest available now! View Shoppers Drug Mart newest arrivals products for your chance to win 1 of 50 $100 Shoppers Drug Mart Gift Cards. No purchase necessary to enter the contest. This contest is valid now until Friday, March 24, 2017 at 11:59 pm ET. Click here to get more information and enter the contest. Excel Canada has a new promotion for 2017! 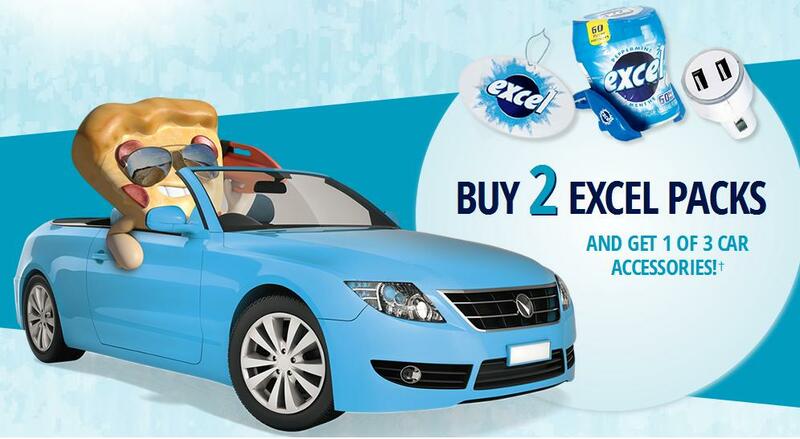 Purchase any two packages of Excel gum and get one of three available car accessories with the Excel-erate Your Ride Promotion. Any two packages of Excel gum qualify for this promotion, and you can register and upload your receipt by clicking the link below. The three car accessories that you may receive are an Excel USB car charger, an Excel bottle car clip, or an Excel spearmint scented air freshener. Unfortunately, the accessory that you will receive is randomly selected and there is no way to chose which one you would like. However, if this is a product you will purchase anyway then any freebie is a bonus. The promotion will run until April the 21st, 2017, or while supplies last. Click here to upload your receipt. The Source Canada has a new contest! 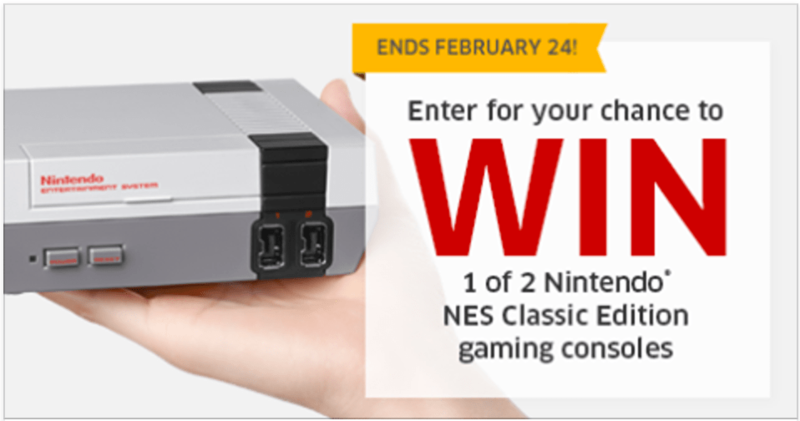 Enter for a Chance to WIN 1 of 2 Nintendo NES Classic Edition Gaming Console. To enter the contest, just tell The Source your favourite NES character and why you love them to be entered for your chance to WIN! Limit 1 entry per person. The contest closes Friday, February 24, 2017. Click here to enter The Source contest. The Sears Canada Super Weekend Sale is valid from today, Thursday, February 16, 2017 until Sunday, February 19, 2017. Sears Canada has FREE shipping on $99 online orders or you can choose to ship your order (no minimum) FREE to any Sears department or home store. Click here to get Sears Canada online deals.